Decide you want to contribute to the health and wellbeing of your employees. Select a local REPs registered fitness professional who is endorsed to run the programme and sign up with them. 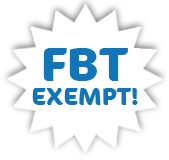 Claim it as an FBT exempt business expense. These programmes will be provided by a variety of personal trainers, gyms and studios anywhere in New Zealand. The Exercise Association of New Zealand will review all programmes to make sure they meet the requirements the IRD deem allow them to be FBT exempt. These programmes will then be endorsed and a list of them available on this website for any employer to access. Each fitness business can set it’s own rate for the programme so you would need to discuss fees directly with the personal trainer, club or studio that you will be working with. is it a certain length? No again, each fitness business will offer programmes of varying length to suit the client. It must be stressed from the outset that this FBT-exempted product does not include gym memberships per se. It only applies to a specific exercise-based product fulfilling the necessary criteria. Some facilities may wish to offer an ‘upgrade’ option to include a membership, but there are guidelines that must be followed and the membership portion is NOT FBT-exempt.